The company was founded in 1850 in Mirandola, a small town in northern Italy in the province of Modena and it went by the name of PIETRO DONDI & FIGLI S.p.a. The main business moved to Bastia Umbra (Perugia) in central Italy in 1991 and the company name was changed to DONDI S.p.A. Ever since it was established, DONDI has followed a philosophy of striving for top quality in its products and services, and its 150-year history is proof of the company's vitality and its flexibility to changing market and customer requirements. The company is the undisputed leader in the pruduction and the sale of ditchers and drainage machinery with the DONDI trademark. The Rotary Ditcher can be used in agriculture to dig and maintain rainwater drainage ditches and channels for irrigating particular crops such as banana and sugarcane plantations. The ditchers can also be used to clean and maintain ditches along suburban roads to prevent uneven roadbeds and flooding. Drenag cut s vertically into the soil in order to lay drainage pipes and underground irrigation systems for the agricultural sector, the public landscape maintenance sector and for outdoor sports facilities. In recent years, Dondi has also devoted itself to the design and production of machines specifically conceived for the maintenance of ditches, channels, and roadsides employing state-of-the-art technological solotions. 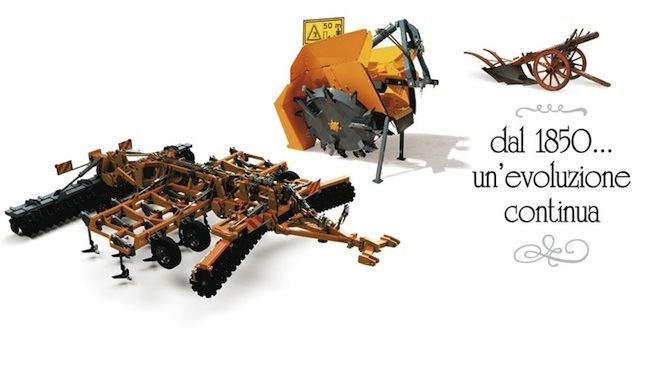 Dondi is also present on the traditional market of agricultural machinery with subsoilers, cultivators, post hole diggers and disk harrows, all characterized by a high level of quality and effiency. 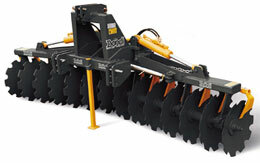 "DONDI" Double-wheel rotary ditchers offer the highest level of technology and performance for digging and maintaining drainage and irrigation ditches. They can beused on any wheeled tractor with with creep speeds of 0.4/0.6 for digging new ditches, while a higher advancement speed of up to 1.2 km/h can be for simple maintenance work. The standard digging angle is 32°, and digging angles of 18°, 23°, 42° are available on request in order to adapt to different types of soil and various needs. In order to use the ditchers, the tractor must be ballasted in the front and widened in the front and rear wheel track as much as possible. A new ditch is dug in one or more passages, depending on the type of soil, tractor power and advancement speed. The excavated soil is distributed evenly on both sides. On request, supplementary rubber covers are also available to protect crops or form two lateral embankments. The work dept is regulated via the hydraulic hoist of the tractor in a controlled position. To create new ditches, we recommend using tractors designed for creep speeds of 0.8/1.2 km/h, whereas periodic maintenance of existing ditches can be done at a maximum advancement speed of 1.2/1.4 km/h. The standard digging angle is 30°. The work dept is regulated via the hydraulic hoist ofof the tractor in a controlled position. 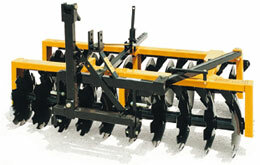 The main feature of the mono/double-wheel model is that it can dig and smooth the two walls of the ditch simultaneously, unloading the soil completely on the right side of the machine in relation to the direction of forward movement. This particular characteristic makes it possible to concuct work bordering along roadways, on growing crops that need to be protected and for different types of soil. 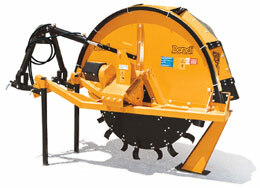 The "DONDI" mono/double-wheel ditcher can handle applications from 40 HP to 150 HP, and up to a maximum depth of 110 cm. 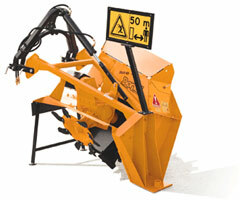 This device enables the excavation and maintenance of ditches set laterally with respect to the tractor. During the transport phase, the ditcher is positioned vertically. 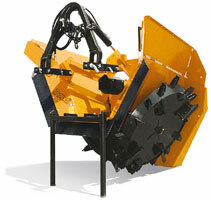 The lateral device can also be supplied individually for mounting on any type of ditcher. Motion is transmitted via cardan shafts. There are two models available: one makes it possible to work at a distance of 160 cm and the other at a distance on 240 cm from the center of the tractor to the center of the excavated ditch. DONDIDRENAG is effective on any type of rock-free soil to open drainage ditches and lay drainage and irrigation pipes, electrical and telephone cables, and pipes for water mains with a maximum diameter of 150 mm. DONDIDRENAG is used on the three-point hitch of any type of any type of tractor with wheels with creep speeds of 0.35 / 0.65 km/h and is driven by a power takeoff at 540 and 1000 rpm. The work dept is adjusted via hydraulic hoist of the dractor and a hydraulic jack on the DRENAG performs the startup operation until the desired depth is achieved. The different cutting widths are obtained simply by inverting the position of the blades on the 8- and 14-cm rotor disk and with a kit of pads to bring the width to 20 cm on models 75/100 and 100/120. The excavated soil can be removed laterally or can be left near the ditch to fill it after the pipes have been laid. On request, the drenag 75/100 and 100/120 can be outfitted with a complete kit for dereeling pipes and/or cables while the ditching is under way. DONDIDRENAG is delivered complete with a Cardan shaft, safety clutch and and third-point hydraulic hitch in the 75/100 and 100/120 models. When working with hard and rocky soils, the machine can also be equipped with tools with tungsten bits. 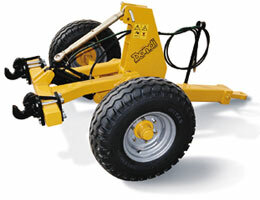 The universal fast coupling trolley is ideal for transforming supported subsoilers to be mounted on crawler tractors without three-point hitches. The trolleys from the CTR line are fitted with adjustable hitches to adabt them to the various models to which they are connected. A special valve enables automatic adjustment of the working depth of the subsoiler (CTR 500) and the special arm-positioning feature helps unload part of the lifted weight on the wheel axle for better balancing during movement.